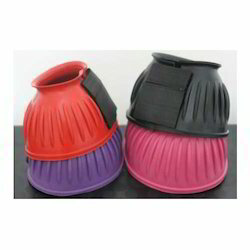 Leading Manufacturer of horse brushing boot, horse tendon boot and horse bell boot from Kanpur. We are a noteworthy manufacturer, exporter and supplier of an optimum quality Horse Brushing Boot that is designed by our skilled designer, from superior quality material and modernized technology that assure its remarkable quality. Apart from this, our designers use creativity at their best to give unique designs. It is tested on well defined parameter for ensuring its flawlessness. Furthermore, clients can avail the entire range of boots at affordable prices. 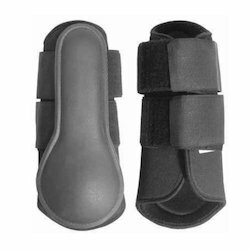 By keeping track with the latest fashion trends, we are bringing forward an excellent quality Horse Tendon Boot in plethora of colours, styles and patterns. Our offered boot is beautifully designed by our skilled designer with the use of premium quality material. This boot is tested on various parameters to ensure its flawlessness at clients' end before the dispatch in the market. Owing to its perfect finish and strong design, this boot is broadly demanded among the clients all across the world. 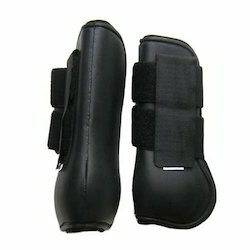 We are the prominent manufacturer, exporter and supplier of beautiful range of Horse Bell Boot. Our designer boots are designed using rubber moulds and double velcro closure. Apart from this, clients can avail these boots from us in various alluring designs which protect horse legs from any injury and keep it safe. Moreover, we are offering our boots to our prestigious clients at highly affordable prices.